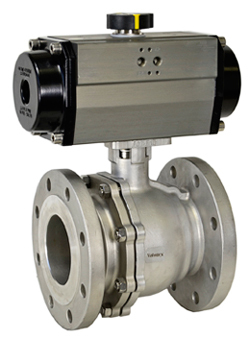 Valworx 525242 air actuated ANSI 150# stainless steel flanged ball valves are designed for general chemical and industrial applications. Full port 2-piece designed investment cast valve direct mounts to the actuator with standard ISO5211 mounting pad. Double acting actuators use an air pressure signal (80-120 PSI) to open and close the valve. Maximum working temperature of assembly is 180 °F. Order optional valve mounting kit to extend media working temperature to 300 °F (suitable for steam up to 50 PSI max. with kit). Ball valve can be mounted in any orientation. All valves are tested per API 598. Direct Mount Stainless ANSI 150# Flanged Ball Valve 4"